Ready for Valentines or still looking for something to bake last minute? If you are still searching for something then your search is over.. 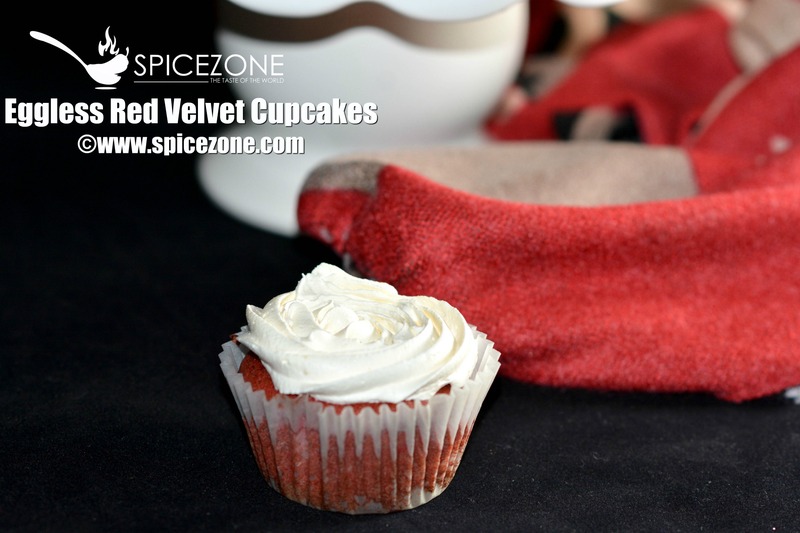 Try these easy Eggless Red Velvet Cupcakes and impress your loved ones. Just wasn't up for anything, then decided to bake these beauties. Hope I am not too late…Even if I am, you can make these any day, it doesn't have to be Valentine's Day!!! Red Velvet Cupcakes goes well with cream cheese frosting usually, but here I have used the whip cream as my family is not fond of cream cheese frosting. You can use your choice of frosting you want. I made rosettes using whip cream, you can decorate as per your wish. I did read a lot of recipes and then went with this one. So what are your plans for the special day? Anything in particular or treating the day as just another day..Hope not, make sure you get to do something special or your other half spoils you with gifts or flowers..
Wishing you all a very Happy Valentine's Day……Lets get to the recipe now.. Combine flour and cocoa powder in a bowl and set aside. Preheat oven to 350º F. Line the cupcake pans with liners and lightly spray them with cooking spray. Using the paddle attachment of your electric mixer, on medium speed, beat together butter and sugar until smooth. Once smooth add oil and vanilla essence and mix again. Add milk and vinegar to the mixture. And now add the food coloring and keep mixing until it is combined together. At this time add the flour mixture and let the mixer run until combined. Do not over mix the batter. Divide batter evenly among liners a little bit more than half. Bake for 18 – 20 minutes or until a toothpick inserted into the center comes out clean. Let it rest for 5 minutes in the pan then turn out onto a cooling rack and allow to cool completely before frosting. Whip the cool whip with the castor sugar until its slightly stiff. Place the star tip and fill the pastry bag with the cream to decorate. I have decorated the cupcakes with rosettes, you can decorate as you like. Notes: If you don't have the self rising flour, you can make it at home. 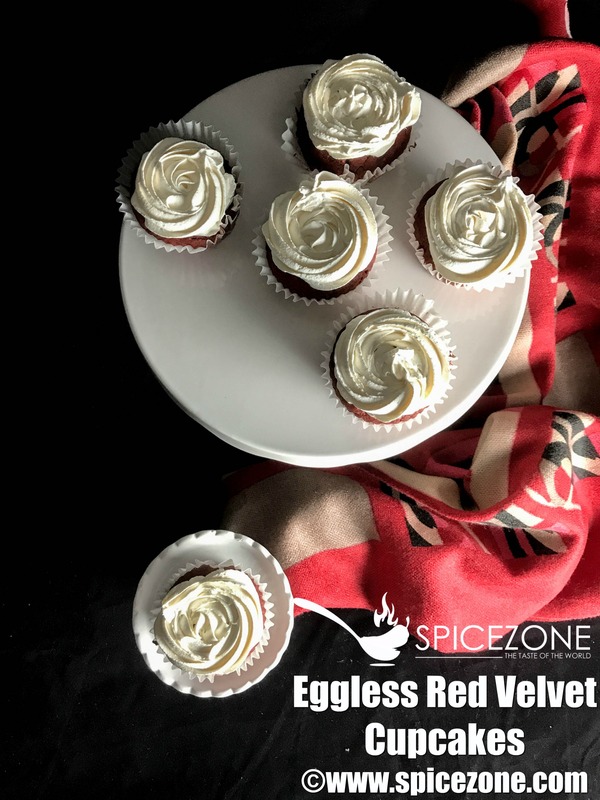 Spoil your loved one with an easy recipe for Eggless Red Velvet Cupcakes this Valentine's Day and other special days such as birthday. At this time add the flour mixture and let the mixer run until combined. Do not over mix the batter. Divide batter evenly among liners a little bit more than half. Bake for 18 - 20 minutes or until a toothpick inserted into the center comes out clean. 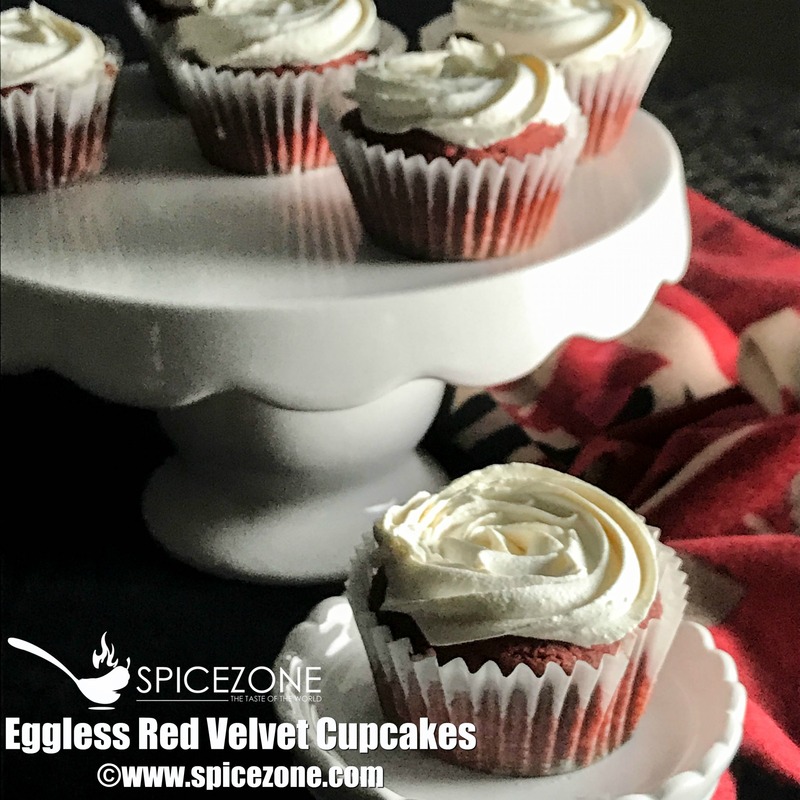 2 Responses to "Eggless Red Velvet Cupcakes"